It’s an accomplished geographer who can confidently point to Turkmenistan on a map. Despite being similar in size to Spain, this Central Asian nation remains well under most people’s radar. There are two reasons for this. One is that Turkmenistan is a country comprised largely of barren desert and untamed terrain – hardly a big draw for tourists. But the main reason for its obscurity can be traced to Turkmenistan’s autocratic government, which has been compared to the regime of North Korea. If you’re not put off by repressive regimes, Turkmenistan is a destination that offers one thing most others don’t: the chance to travel across the country without seeing other travellers. The isolation is palpable. The brave few who do make it here usually arrive via the capital, Ashgabat. This modern city was built in 1948 after an earthquake destroyed the previous incarnation. Visitors can learn more about this devastating event at the touching Earthquake Museum, one of the city’s finer attractions. Many of Ashgabat’s other landmarks take on a Soviet flavour – Independence Square, the Arch of Neutrality, numerous Lenin statues – but there are also mosques, galleries and gardens. The Altyn Asyr bazaar is worth a visit too, especially if you’re in the market for a Turkmen carpet. Outside the capital, almost all of the country’s attractions lie around the fringes of the desert. Some of the world’s most powerful empires settled here and their crumbling legacies can be seen at the Parthian Fortress of Nisa, Kunya-Urgench and Merv, which are all UNESCO-listed World Heritage Sites. And quiet ones at that. 488,100 sq km (188,456 sq miles). President Gurbanguly Berdymukhamedov since 2007. All commercial passenger flights operating to and from Istanbul Ataturk Airport are due to be transferred to the new Istanbul Airport between 5 to 7 April 2019. During the transition period there will be a short period of time where no flights will operate from either airport, and thereafter restrictions of the frequency airlines can operate at, until the transfer is completed. Passengers travelling via Istanbul may be affected by delays and cancellations during the transition period and for a limited period after the transfer, and should contact their airline for further information. Once the transfer is completed, the IATA airport code IST will apply to Istanbul Airport and Istanbul Ataturk will acquire IATA airport code ISL. More information for affected UK passengers is available on the Civil Aviation Authority (CAA) website. Additional charges of up US$150 are being levied at the land and sea borders for vehicles. This is additional to the visa fee. The charges are payable in cash in US dollars on entry. The border between Turkmenistan and Kazakhstan is currently closed to traffic. You’re advised not to try to cross the road border but to seek alternative routes, such as via Uzbekistan, until further notice. In 2017 a new “tourism tax” was introduced. All foreign visitors, with the exception of accredited diplomats, are charged 2 US dollars for each day of their stay in Turkmenistan. If you’re staying in a hotel, this tax will be included as a separate item on your bill. Although there’s no recent history of terrorism in Turkmenistan, attacks can’t be ruled out. You should carry identification at all times. The police often carry out checks. Visa requirements are strict. You should contact the Turkmen Embassy in London well in advance of travel. If you are staying for more than 3 days, you will also need to register with the State Migration Service. Don’t overstay your visa. If you need to contact the emergency services, call 01 (from landline) or 001 (from mobile) for fire, 02 (from landline) 002 (from mobile) for police, and 03 (from landline) 003 (from mobile) for an ambulance. Although there’s no recent history of terrorism in Turkmenistan, attacks can’t be ruled out. You should be aware of the global risk of indiscriminate terrorist attacks, which could be in public places, including those visited by foreigners. Incidents of mugging, theft and pick pocketing are rare, but take sensible precautions and keep valuables out of sight. You should avoid going out alone late at night as after midnight the police and security forces are suspicious of people on the streets. Unaccompanied women in particular may draw their attention. Turkmen border crossings can be subject to occasional and unannounced closures. Certain areas of the country, particularly border areas, are designated restricted zones and require special permission to enter. The borders with Afghanistan and Iran are particularly sensitive. Ashgabat, the Caspian port of Turkmenbashi, and the ancient Silk Road city of Merv/Mary are not in restricted areas. Check with your local tour guide before travelling outside the capital. You can use a UK driving licence to drive in Turkmenistan for the duration of your stay. Alternatively, you can use a 1968 International Driving Permit (IDP). IDPs can be purchased over the counter from UK Post Offices. You will not be able to buy an IDP outside the UK, so get one before you travel. If you move permanently to Turkmenistan you will need to take a three month training course and apply for a Turkmen driving licence to the Road Safety Directorate of the Ministry of Interior. Driving standards are poor. Road travel at night outside cities is particularly dangerous because of the condition of the roads. There is a 60kmh speed limit in much of Ashgabat, enforced by both static speed cameras and police with mobile speed cameras. There are no signs warning that speed cameras are in use. Seat belts, if fitted, should be worn at all times. Licensed taxis are clearly identified and yellow in colour. Although taxis have meters, drivers will usually ask foreign nationals for a set fee of around 20 Manat. Taxis from the airport cost more. Some taxis might also ask for payment in dollars. You should be cautious about this as it’s against the law. Most taxi drivers do not speak much English. Don’t use unlicensed taxis. Rail travel is slow and can be uncomfortable. If you have to travel overnight, keep valuables in a safe place. Don’t leave the compartment unattended. Lock the door from the inside. We can’t offer advice on the safety of individual airlines. However, the International Air Transport Association publishes a list of registered airlines that have been audited and found to meet a number of operational safety standards and recommended practices. This list is not exhaustive and the absence of an airline from this list does not necessarily mean that it is unsafe. In 2010, the International Civil Aviation Organisation carried out an audit of the level of implementation of the critical elements of safety oversight in Turkmenistan. A list of incidents and accidents in Turkmenistan can be found on the website of the Aviation Safety network. It is not clear whether maintenance procedures are always properly observed on internal flights. The political situation is calm. Nonetheless, there is traditionally a relatively high level of security in Turkmenistan. At the end of September 2017, the Russian mobile network provider MTS suspended its mobile phone and internet service in Turkmenistan without warning. This leaves a single state-owned mobile telephone provider, Altyn Asyr, which uses the TM CELL brand. Altyn Asyr doesn’t provide a roaming service and the quality of the network is low. Internet connections outside the larger hotels can be unreliable and many social media and sites, such as YouTube, Twitter and Facebook are blocked. Some messaging Apps, such as Whatsapp, are also blocked. Access to Yahoo, gmail and hotmail are currently proving difficult. VPNs are illegal in Turkmenistan, and are usually blocked as soon as the authorities pick them up. Possession and use of drugs is illegal. If you are found guilty, you could face a lengthy prison sentence in very basic conditions. Male homosexual activity is illegal, punishable by a custodial sentence. Homosexuality is still very much disapproved of socially. You should take care over public displays of affection. See our information and advice page for the LGBT community before you travel. There remain sensitivities around relationships between foreign men and local women, and the Turkmen authorities are known to take action against both. For foreign nationals this can result in a fine and deportation from the country. Photographing official buildings is forbidden. Check before taking photographs near potentially sensitive sites such as airports, military barracks, police stations, government buildings, embassies and the Presidential Palace. The Turkmen can also be sensitive about pictures being taken in the Teke, Russian and Tolkuchka bazaars in Ashgabat. It is against the law to smoke outside in Turkmenistan; this law extends to restaurants and other communal spaces (unless they contain a designated smoking area). From January 2016 a new regulation has banned the import of more than 2 packets of 20 cigarettes per person, 2 cigars and 2 packets of loose tobacco not weighing more than 2 packets of cigarettes. Cigarette sales are restricted to state run shops and outlets. It is against the law to give tobacco products as a gift; if you are caught you could be fined. You can import up to a maximum of 1.5 litres of alcohol. On 1 August 2017 a new “tourism tax” was introduced. All foreign visitors, with the exception of accredited diplomats, are charged 2 US dollars for each day of their stay in Turkmenistan. The British Embassy is still awaiting official clarification of the full regulations of the new tax from the authorities, but hotels have already implemented this new policy and include the tax as a separate item on guests’ hotel bills. The following information is subject to change. You should consult the Turkmen Embassy in London well in advance of your intended travel date. All visa applications made at Turkmen Embassies in the UK and overseas are referred to Ashgabat for a decision. This can take 20 days or more. There is an accelerated 24 hour service, but a supplementary fee of approximately US$150 will be charged. British nationals need a visa to enter Turkmenistan. You will need a letter of invitation, certified by the State Migration Service of Turkmenistan, from a private individual or company to support your application. For tourists, these can be obtained from authorised travel agents. A list is available from the British Embassy in Ashgabat. Those travelling on business for the first time must obtain letters from relevant ministries, departments or companies they wish to co-operate with, unless the visit is made to attend an exhibition or other event, in which case the organiser normally provides visa support. Without prior approval from the Turkmen authorities, it is not possible to enter Turkmenistan. 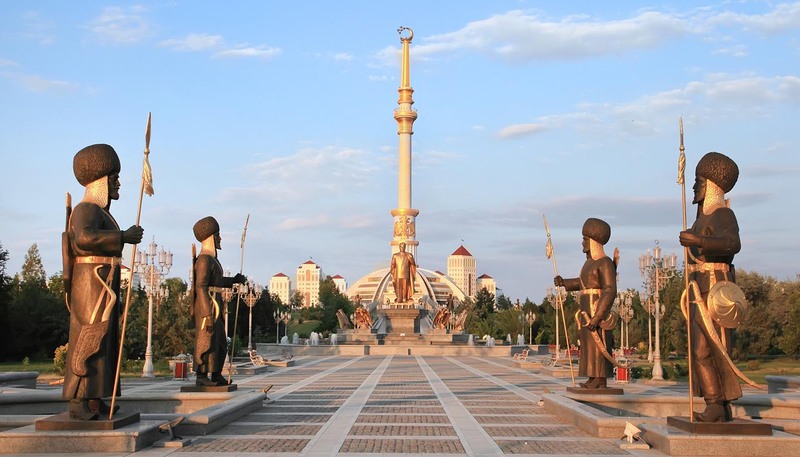 It is possible to buy a visa on arrival at either Ashgabat airport or the ferry port at Turkmenbashi but only if you have approval from the Turkmenistan Migration Service before arrival. If you break your journey or try to enter Turkmenistan without the right visa you will face a long and uncomfortable wait in the offices of the Immigration Service at the airport or ferry port. In addition to a visa fee, there are charges of up to US$150 for vehicles entering Turkmenistan by either land or sea. These can include elements for disinfection, an entry permit, insurance and a compensatory amount for fuel subsidies operating in Turkmenistan. The rate is changeable and varies depending on the entry point, the type of vehicle, its engine capacity and distance you intend to travel. All are payable in cash in US Dollars on entry. If you are staying for more than 3 days you should register with the State Service of Turkmenistan for the Registration of Foreign Nationals. All foreign nationals need a visa to transit Turkmenistan. You can be registered at entry and exit points if your stay is not longer than five days and you hold a valid transit visa. But you won’t be able to change your transit visa in-country, and you must notify the authorities if you intend to vary your route through the country. If you intend to travel from Turkmenistan to Azerbaijan across the Caspian Sea you should be aware that it is not possible to buy a visa on arrival at Baku seaport. Make sure you have a valid visa to enter Azerbaijan if you take the ferry. Dual nationality isn’t recognised in Turkmenistan. If you enter Turkmenistan on a Turkmen passport and also hold British nationality the British Embassy can only provide very limited consular assistance. In cases of arrest or detention, consular access is unlikely to be granted. On arrival, you must pay a US$14 migration fee ($10 fee plus $4 Admin charge). You must register within three days of arrival with the State Migration Service of Turkmenistan at their office at 57 Azadi Street, Ashgabat. Registration is for the period of the visa and may be carried out on your behalf. If you are not staying in Ashgabat, you should register at the local department of Migration Service instead. You should bring two passport size photos. The State Migration Service of Turkmenistan will need a letter confirming your departure from Turkmenistan. A de-registration stamp in your passport is no longer required. Non-compliance with these requirements could lead to prosecution and possible detention. Single parents or other adults travelling alone with children should contact the Turkmen Embassy in London for advice about the documents that will be required at immigration. If you intend to enter Turkmenistan with medicines, whether prescription or non-prescription, you should check in advance the list of prohibited medicines and the legal quantities of medicines that are allowed into the country. If you’re in any doubt, check this with the Turkmen Embassy in London before you travel (telephone 020 7610 5239). Substances of concern to the Turkmen authorities include but are not limited to tramadol, morphine, opiates or any other constituent competent that may be considered as a narcotic drug or psychotropic agent. Possession of these items can lead to administrative or criminal proceedings if you don’t have a prescription, or if you’re carrying more than you need for your visit and don’t declare them on arrival. If you’re travelling with prescription medicines, you should carry a doctor’s prescription and declare the items on your customs declaration form. Some medicines that are non-prescription in the UK, including codeine, can cause problems on entry into Turkmenistan. Issues have been reported at both the international airport and land borders. You won’t be able to enter or transit Turkmenistan using a UK Emergency Travel Document (ETD). If your ETD has been issued in Turkmenistan, you will need an exit visa from the State Migration Service of Turkmenistan or Department of Visa and Registration before you can travel out of Turkmenistan. This process can take up to 5 working days. The reciprocal healthcare agreement between the UK and Turkmenistan terminated on 1 January 2016. The quality of medical care is poor. There are some diagnostic facilities, particularly in Ashgabat, but treatment may be unreliable or even unwise due to poorly trained staff, and a lack of drugs and equipment. Anything other than basic or emergency treatment, particularly away from the capital, is usually best avoided. Make sure you have adequate travel health insurance and accessible funds to cover the cost of any medical treatment abroad and repatriation. Air quality in Turkmenistan can deteriorate from time to time. If there is a deterioration in outdoor air quality, eg due to weather events, you should minimise your individual exposure to external air by staying indoors in an air-conditioned environment as much as possible, with windows and doors closed and as well sealed as possible. Wash all fruit, vegetables and other foods which might have been exposed, and regularly damp dust all indoor surfaces, washing your hands afterwards. You’re advised to monitor local reports and weather forecasts for the latest information and local advice. Typhoid and hepatitis A are endemic. You should ensure your inoculations are up to date. You should drink or use only boiled and filtered or bottled water and avoid ice in drinks. Avoid unpasteurised milk. In the summer temperatures regularly reach 45 Celsius in the shade, so drink plenty of water in the summer and avoid sunburn. The number for the local ambulance service in case of an emergency is 03. Please note however that the operator may only speak Russian or Turkmen. You should contact your insurance/medical assistance company promptly if you are referred to a medical facility for treatment. Turkmenistan is located in an active seismic zone. Earth tremors can occur and there is a possibility of earthquakes. The US Federal Emergency Management Agency has advice about what to do before, during and after an earthquake. Ashgabat was largely destroyed by an earthquake in 1948, when up to 100,000 people were killed. Turkmenistan remains largely a cash-based society. You should carry cash and pay in the national currency, although some larger hotels accept US dollars. There are only a limited number of international ATMs in Ashgabat (see list below) and there’s a 3% withdrawal charge for each transaction. Visa and MasterCard are the only cards currently accepted and only at some larger hotels, but even they can be used only at some larger hotels and a limited number of shops. ATMs sometimes run out of Manats and are not replenished until banks have the available stocks. the State Bank for Foreign Economic Affairs, 32 Garashsyzlyk st. US Dollars and Euros can be easily exchanged into the local currency (Manat) at banks and Bureaux de Change. As Manat can’t be re-converted into hard currency, convert only as much as you need. Bring new or clean notes in low denominations as damaged or marked notes are often refused even by official travel exchange offices. Other currencies are difficult to exchange. Foreigners will be expected to pay for hotels and hotel services in dollars if not using credit cards, but all other payments in Turkmenistan need to be made in cash in local currency. Some shopping outlets and taxis might also request dollar payments but caution is recommended as strict controls and harsh penalties are being applied to those who are caught. Currency regulations are also liable to sudden and unannounced change.